If you’re pulling in hashtag posts from a network like Instagram or Twitter, you probably want to prevent certain content from being displayed. Juicer makes it easy. We offer built-in moderation and filtering features that help you block unwanted posts, so only the content you approve gets through. All paid Juicer plans come with full moderation and filtering capabilities. You can also try these features free for one week on our Small (free) plan, at juicer.io/sign-up. Juicer’s moderation features are easily accessible from the main dashboard of any feed. Remember that in Juicer’s terminology, feed = the embeddable social wall, and source = a single source of content that appears within the feed, such as a Facebook page, Twitter account, Instagram hashtag, etc. Click the “Moderate and Filter” button along the left-side menu to bring up these features. If you’re going here for the first time, it will say “Off” next to this button. After you have enabled any of the features, it will say “On” next to this button. When the Public Posts button is highlighted, the posts you see in the panel to the right are currently in your live feed. When the Moderated Posts button is highlighted, the posts you see have been blocked from your feed, and are awaiting your review. Next is the “Send All Posts to Moderation” button. This is a popular feature that gives you the most control over what appears in your feed. When enabled, this will send all posts directly into your Moderated Posts section. No post will appear in your live feed without your approval. It will be up to you to browse through the Moderated Posts and click “Approve” or “Reject.” If you want to clean out this section, you can also click “Approve All” or “Reject All” at the top. If you would rather automate what is blocked and approved for your feed, the rest of the features in the Moderate and Filter panel will allow you to do so. First are the “Disallow posts with these words” and “Only allow posts with these words” fields. Please note: These two fields are case sensitive. If you are blocking/allowing a certain word or phrase, enter it using several different forms of capitalization to ensure you block every instance. For example, if you want to block all posts that contain the word “cheese,” enter this word into the “Disallow” field with various capitalizations, such as Cheese, cheese and CHEESE. Separate these words with commas. Specific users on a social network are posting unwanted content using your hashtag. You can enter their usernames into this field to block their posts. Your hashtag is being used by another group. You may be able to find a certain word or phrase that is used consistently in those unwanted posts, which you can enter into this field. You have entered your social media accounts as sources for your feed, but you only want to display posts containing a certain hashtag. You can enter that hashtag into this field. Note that this will only display the hashtag posts from your source accounts, not from other users across Instagram, Twitter, etc. You are pulling in posts for a hashtag, but you only want to display posts that contain the source hashtag and another hashtag simultaneously. You can enter the second hashtag into this field, and Juicer will sort through the posts to display only those that contain both hashtags. These two simple checkboxes will keep many unwanted posts from entering your feed. The library of profane words and statements that will be blocked by “Don’t allow posts with profanity” is immense. It is unlikely you will need to add more inappropriate words into the “Disallow” field. The “Prevent duplicate posts” filter will block posts that contain identical text and are from two different sources. Juicer can’t analyze images, so the post text must be identical to trigger this filter. Remember to click the “Save Your Filters” button when you have made any change. You will be given the option to apply your change to all existing posts in your feed and to new posts, or only to new posts going forward. Juicer sorts your moderated posts into several sections to make approving and rejecting posts easier. All – This contains every post that is currently in your moderation area, with the exception of posts you have already rejected from the moderation area. Filter – These posts have been blocked by the “Disallow posts with these words” and “Only allow posts with these words” filters. 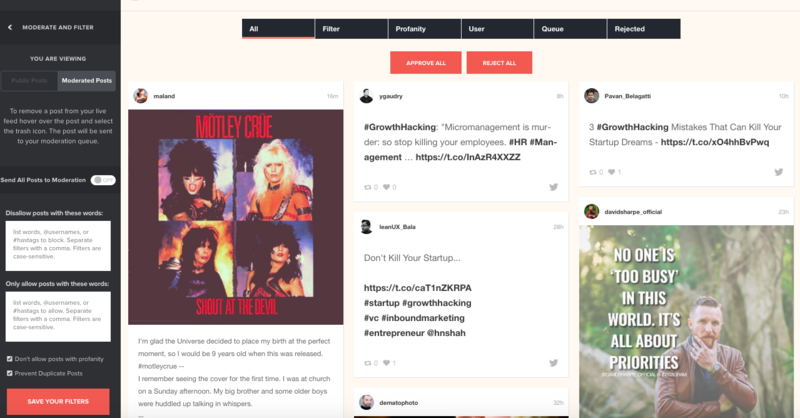 Profanity – These posts have been blocked by the “Don’t allow posts with profanity” checkbox. User – These are posts that have been removed manually from the “Public Posts” area by hovering over them and clicking the trash can icon. Queue – If you have enabled the “Send all posts to moderation” feature, this section will display posts that have not been blocked by other filters. This will be the section you primarily work from if you are looking for posts to approve and reject for your feed. Rejected – These posts have been rejected from the “Moderated Posts” area. You can still approve them from here, even after you have initially rejected them. 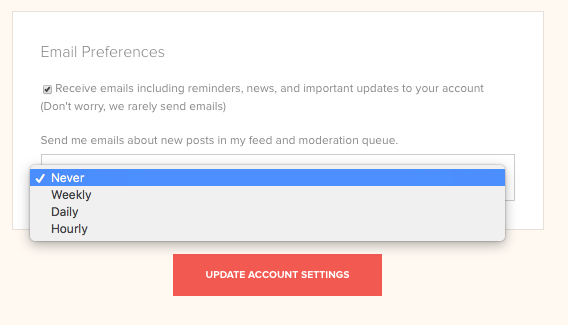 From your Account Settings, you can enable email notifications that alert you when new posts are in your feed or awaiting approval in your queue. Planning to Send All Posts to Moderation? This Trick Will Make Sorting Through Posts Easier. When you enable the "Send all posts to moderation" feature, the other filtering features become faded and un-clickable. However, if you enable these other filters prior to turning on the "Send all posts..." feature, it can make your post approval process simpler. For example, if you enable the "Don't allow posts with profanity" feature prior to turning on the "Send all posts to moderation" feature, then posts with profanity will be blocked from the "Queue" section of your Moderated Posts. This way, you don't need to sort through posts with profanity when finding posts to approve. 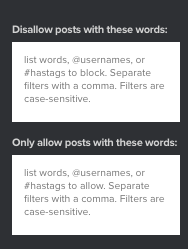 You can apply this to any of the other filtering features, such as "Disallow posts with these words." 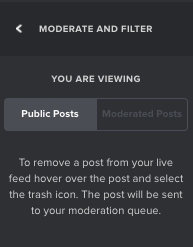 After these are set up how you want them, you can turn on the "Send all posts to moderation" option, and work from the "Queue" section of your moderated posts. You will avoid having to sort through posts you definitely don't want in your feed. As always, if you have any questions or need assistance with the moderation and filtering of your posts, please contact us at hello@juicer.io. We're happy to assist you.